We have been enjoying the weather and making the most of it by playing outside! We made some lovely yellow gloop today which helped us to explore our senses. It also developed our language through describing the texture of the gloop , “Sticky, slimy, cold, soft slippery”. We have also enjoyed having a picnic in the garden with our friends and develop our physical skills by playing on the bikes. The mornings are getting brighter and sunnier and the flowers starting to emerge in the garden, our rhyme of the week is Mary, Mary Quite Contrary. We decided to make an indoor garden and decorate it with shells and ‘pretty maids’. 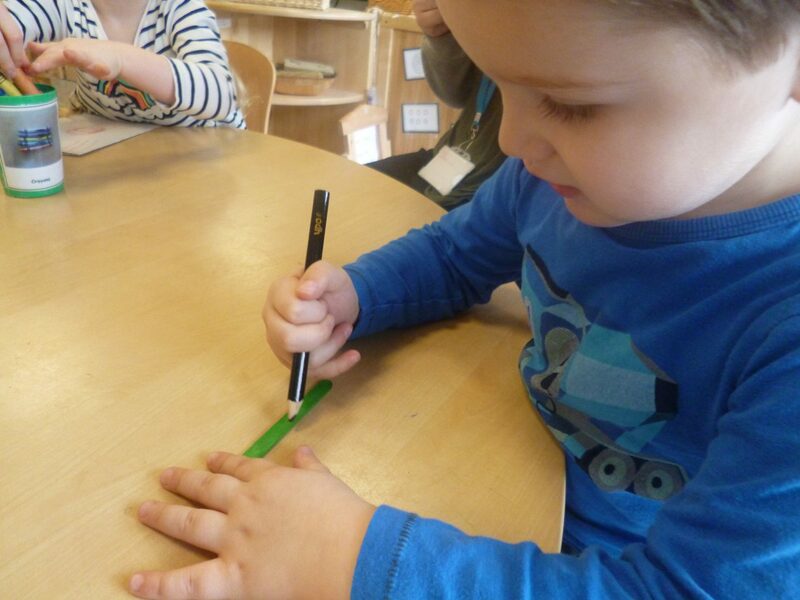 We have been having lots of fun roleplaying with the indoor garden and singing the rhyme! Making flowers for the ‘garden’! The Tuesday group learned about making a fire with safety at the forefront of the learning. Then they toasted marshmallows on the fire. This group got to wear our new waterproof suits today – don’t they look smart? We love to stop and take in the sights and smells on our way to the forest. The children noticed that the crocuses had opened since last week and were just lovely. The mud was very squelchy at the entrance to the park. We nearly lost our wellies in it. We explored a new part of the forest this week. It was fun to try out new things. We learned about making a fire square again this week so that we could set up our kelly kettle. The children gathered the sticks and built the fire square. We boiled the water to make our hot chocolate. Outdoor fun for the toddlers! Today the toddlers were having lots of fun outdoors. The children had fun rolling and catching the large wooden reel, sometimes they had to run to catch it. The children were collecting mud from the ground, filling up their jars and emptying it onto our table in the mud kitchen to make a delicious chocolate cake. “look ladies its a chocolate cake “. We enjoyed using loose parts to create our own pictures,” its a choo choo train”. The children have been learning all about an artist called Henri Rousseau. He created animal pictures and was very famous for his simplistic approach to art. Not a lot of people liked his art and we have been discussing that not everyone will like our work and that is ok. The boys and girls worked together and described what they liked and disliked about their friends artwork. This activity allowed the children to observe, describe and reflect in a positive manner, on their own and their peers artwork.